RadViz is a multivariate data visualization algorithm that plots each feature dimension uniformly around the circumference of a circle then plots points on the interior of the circle such that the point normalizes its values on the axes from the center to each arc. This mechanism allows as many dimensions as will easily fit on a circle, greatly expanding the dimensionality of the visualization. Data scientists use this method to detect separability between classes. E.g. is there an opportunity to learn from the feature set or is there just too much noise? If your data contains rows with missing values (numpy.nan), those missing values will not be plotted. In other words, you may not get the entire picture of your data. RadViz will raise a DataWarning to inform you of the percent missing. If you do receive this warning, you may want to look at imputation strategies. A good starting place is the scikit-learn Imputer. For regression, the RadViz visualizer should use a color sequence to display the target information, as opposed to discrete colors. Implements radviz for feature analysis. 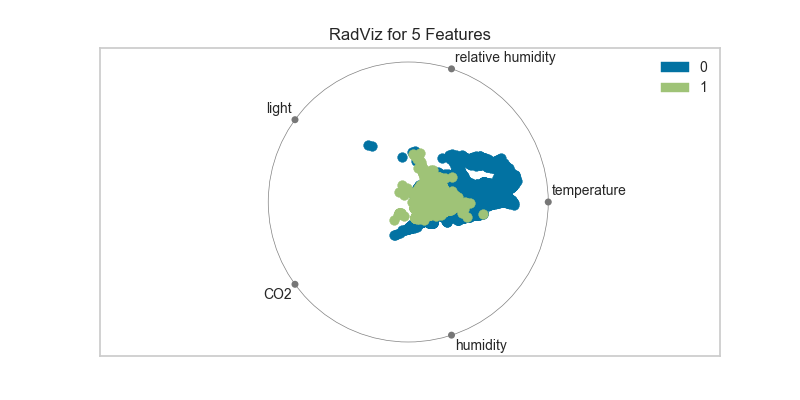 RadViz is a multivariate data visualization algorithm that plots each axis uniformely around the circumference of a circle then plots points on the interior of the circle such that the point normalizes its values on the axes from the center to each arc. Specify a transparency where 1 is completely opaque and 0 is completely transparent. This property makes densely clustered points more visible. Called from the fit method, this method creates the radviz canvas and draws each instance as a class or target colored point, whose location is determined by the feature data set. MinMax normalization to fit a matrix in the space [0,1] by column.